It isn't a surprise or a breaking piece of news, but it is worth noting that one of the best attacking midfielders in the game today, Isco, has been rewarded with a new 5-year contract at Real Madrid. Isco will earn around €6m per year and his release clause is set at a staggering €700m. Isco joined Real Madrid from Malaga in 2013, as one of the top young players the nation of Spain had to offer. Real Madrid, at the time, were focusing on bumping up their local numbers and Isco was their main target. Due to heavy competition at the club, Isco had to fight for playing minutes ever since his arrival. Despite all the trophies he won while in Madrid, including three Champions leagues, only last season the 25-year old Spanish international properly arrived into the spotlight. Isco's performances for Real Madrid and the Spanish national side have been outstanding lately. A lot of it has to do with the Real Madrid coach (and legend), Zinedine Zidane, who trusted and counted on Isco. There were periods of frustration and hard times for Isco during his time on the Bernabeu bench. Over time, he was linked with several English Premier League clubs and most recently with Barcelona, who were pursuing him as his style of play would very much be a good fit with theirs. Isco's patience and focus were rewarded and he is now a regular on the Real Madrid team. 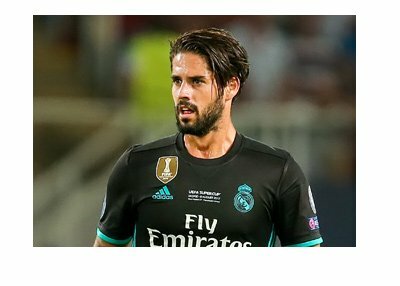 Maybe Isco would earn quite a bit more than €115,000 / week playing for an EPL club, but after all, Isco is Spanish and his dream was to be where he is now. We look forward to seeing more of Isco this season.